Hamanasi Adventure & Dive Resort is a diving resort located between the Mayan Mountains and the Caribbean Sea in Hopkins. With the distinction of being a PADI 5-star Gold Palm Resort, the Hamanasi Resort is a perfect choice for staying at a convenient location from where you can explore the best of the barrier reef activities and more inland attractions than from any other place in Belize. All rooms at the Hamanasi Resort feature handcrafted hardwood furnishings, air conditioning and private porches. 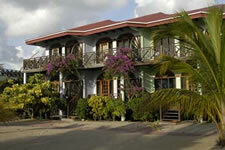 There are four different kinds of rooms, the Honeymoon Suites that are overlooking the beach, the tree houses which are cabanas surrounded by a variety of trees, orchids and birds, then the 2 room beachfront Deluxe Suites that are specially recommended for families traveling with children and the Standard beachfront rooms. All rooms either include two queen beds or one king bed.